As per a news release on September 25, 2013 prices for most Postal Service mailing products and services will change on January 26, 2014. This includes First Class Mail, Standard Mail, Periodicals, Package Services and Extra Services. The proposed changes are intended to generate $2 billion in incremental annual revenue for the Postal Service. Pricing for Standard Mail, Periodicals, Package Services and Extra Services also will be adjusted. In a letter from Board of Governors Chairman Mickey Barnett described the “precarious financial condition” of the Postal Service and the “uncertain path toward enactment of postal reform legislation” as primary reasons for seeking price changes above the CPI increase. He also indicated that the price adjustment above the CPI increase is necessary in order to ensure that the Postal Service will be able to maintain and continue the development of postal services of the type and quality which America needs. Except in exceptional or extraordinary circumstances, postage price increases are capped at the rate of inflation as measured by the CPI-U. The Postal Service is filing a price increase above CPI-U due to extraordinary and exceptional circumstances which have contributed to continued financial losses. The Postal Service recorded a $15.9 billion net loss last fiscal year and expects to record a loss of roughly $6 billion in the current fiscal year, and has an intolerably low level of available liquidity even after defaulting on its obligation to make prefunding payments for retiree health benefits. If your business is not already using a presort vendor, now is the time to look into that service. With ever increasing postage rates, why not take advantage of discounted rates presort houses are able to offer you? How Long Does It Take To Deliver My Mail? Many times our customers ask us how long it will take for their mail to be delivered. USPS provides a neat little tool just for this purpose. Using the tool is pretty simple. 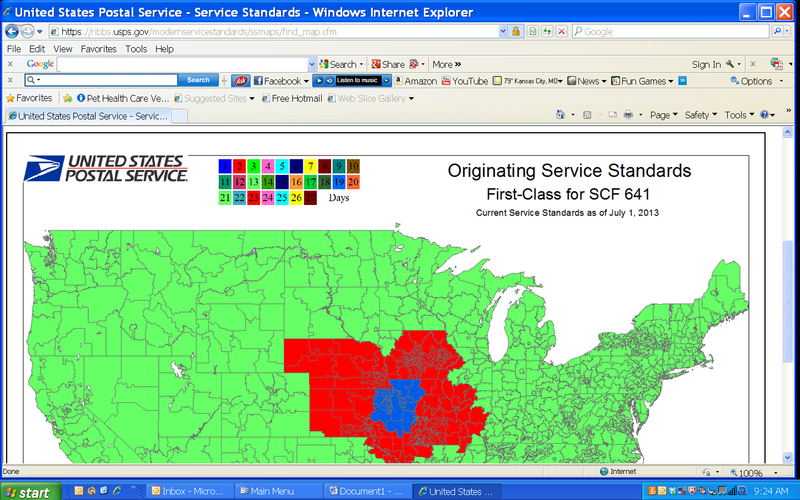 In the upper left corner select the mail class – First Class or Standard. Select the mail origination from the drop down menu and click “Display Map”. These delivery times are typically best case scenarios – they are to be used for estimates only. It is safe to use this as a general rule of thumb but in no way is it a promise of a delivery time. With new services and programs offered by the USPS, not to mention changing mail characteristics, have you changed the way you think about your outgoing mail? Engaging with a Presort Service provider allows companies to take advantage of postal discounts. Discounts are achieved when many pieces are sorted to the same 5-digt ZIP Code. By commingling your outgoing mail with mail from other companies, Presort Service providers are able to maximize postage discounts and pass that savings along to you. The number of organizations choosing to partner with Presort Service providers has grown over the past several years. The driving factors include security, control and economics. Presort Services have made large investments in new technology – both equipment and software. Providers have been working closely with the USPS and mailers to improve workflows and standards. While this has forced many smaller shops to close their doors, larger more robust service providers have been thriving. Do they process First Class, Standard and Non-Profit Mail? Do they process letters and flats? How secure is their facility, including the dock area? Do they provide pick up service? Is there a fee for this service? Will they also meter mail for you? Will they agree to serve as a backup should your own meters be out of operation? Are they up-to-date with Intelligent Mail barcode? This will be mandatory beginning January 2013. Is there an on-site USPS postal verifier? Does USPS pick up from their dock? Or do they deliver to the nearest postal sorting facility? Take a few minutes and think of the ways a Presort Service provider could benefit your organization. Cost savings, improved workflows, and security of your mail are just a few of the advantages these vendors bring to your company. Add value to your mailpiece in a creative way using the new Picture Permit Imprint Indicia. Incorporate a company logo, brand image or trademark to the area where a stamp, meter imprint of permit imprint would appear. Boosting your brand recognition, logos, products and promotions could improve the overall effectiveness of your mailing. 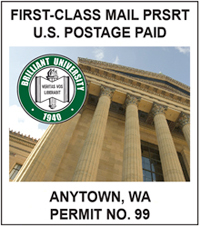 Picture Permit mail is available for presorted First Class mail and Standard letters. Full Service Intelligent Mail barcode is a requirement. There is an extra fee per piece – for First Class letters and cards the additional fee is $0.01, for Standard letters the fee is $0.02 per piece. The USPS will begin a promotion of Picture Permit mail beginning August 1, 2013 and running through September 30, 2013. Registration for the promotion begins June 1. This promotion will eliminate the per piece fees for both First Class and Standard letters and cards. There is a 4 step application process which must be approved by the USPS Program Office prior to promotion registration. How would you use Picture Permit Imprint Indicia to benefit your company? We would love to hear your ideas and successes! Have You Stocked Up On Forever Stamps Yet? Just a reminder that postage rates will increase this Sunday, January 27th. 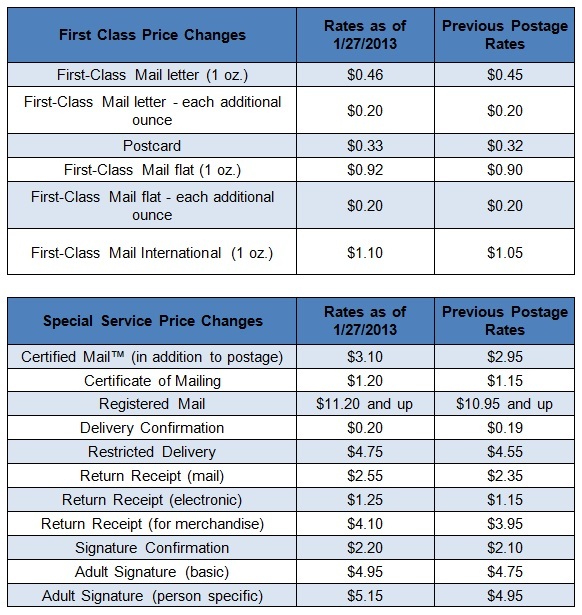 A summary of a few of the changes are detailed in the tables below – a more comprehensive listing can be found with the USPS at http://pe.usps.com/. Business mailing rates will be changing as well during this time. If you work with a business mail provider then they will be able to tell you your new rates and any applicable changes. Forever stamps are a great way to help combat the rising cost of postage. The USPS has released a handful of new forever stamps in 2013 – a few of the new designs can be seen below. Plan ahead and don’t be caught off guard on Monday! 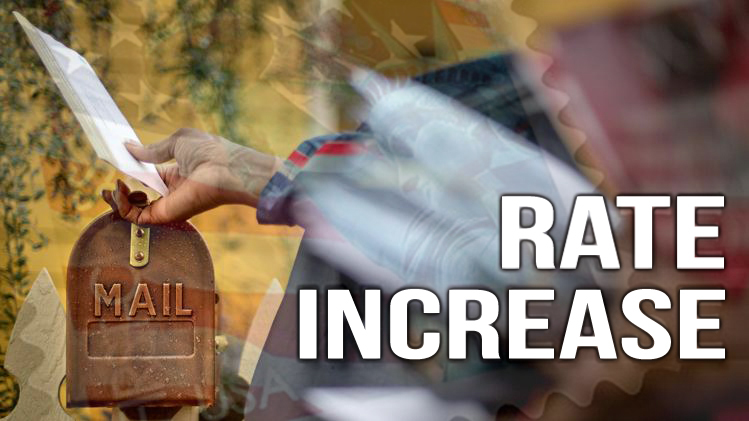 Less than a year ago the USPS increased postage rates a penny and rates are going up again in 2013. Overall, prices will increase an average of 2.6 percent for each class of mail. The Postal Service filed new mailing service prices with the Postal Regulatory Commission (PRC) in October 2012 and the changes were approved within the next month. By law, USPS cannot increase mailing service pricing no more than the rate of inflation, based on the Consumer Price Index. A completely self-supporting government enterprise, the U.S. Postal Service is the only delivery service that reaches every address in the nation. 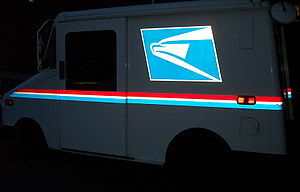 The Postal Service receives no tax dollars for operating expenses and relies on the sale of postage, products, and services to fund its operations. – International first-class pricing will change to one flat rate of $1.10 to any destination in the world. 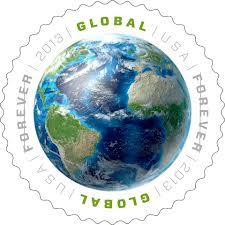 The USPS has also introduced a new Forever stamp for international use, called the Global Forever stamp. This new stamp will always be sold at the price of a single-piece first class international stamp. – Forever stamps also will still be available and can be used whenever they are needed, as they don’t have a denomination. Forever stamps will also increase to 46 cents. Prices for other mailing services including Standard Mail, Periodicals, and other business class mail will also see price increases in a variety of categories. For more detailed pricing information from the USPS visit www.usps.com/prices. Still need more? Strahm also offers a Customer Resource Center containing up to date information regarding the January 27th rate increase and much more! The Postal Service is moving ahead with the rationalization of its network. The implementation will be executed by modifying service standards in two phases. The first phase will begin July 1, 2012, and the second phase will start on February 1, 2014. Should changes in circumstances warrant, this phased approach will allow the Postal Service to reconsider implementation of the second phase. You must make a choice whether to mail First Class or Standard. Of course, there are rules and limitations to what material can be mailed for either class so that will be a factor in driving your decision. First Class Mail – any mailable matter can be sent as First Class Mail. Below are types of mail that must be sent as First Class mail. Standard Mail – includes the subclasses of regular Standard Mail, Nonprofit Standard Mail, Carrier Route Standard Mail and Nonprofit Carrier Route Standard Mail. Let’s say your mail piece is informational in nature and contains no confidential data. You could either mail it First Class or Standard Mail. Let’s go further and say that there is dated information (perhaps an invitation to an event or notice of road construction). 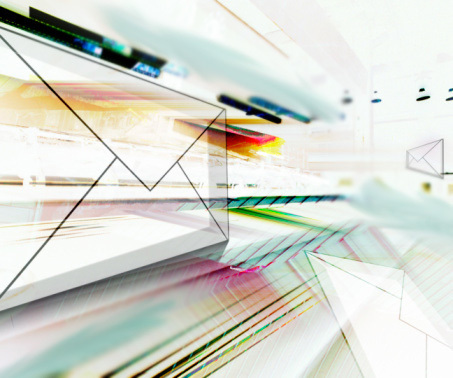 Now your mail class decision lies in deliverability. Taking advantage of the lower postage rates for Standard Mail is a great idea if you plan well enough in advance to account for the slower delivery service standard. The USPS RIBBS website (Rapid Information Bulletin Board – always good information here, folks!) 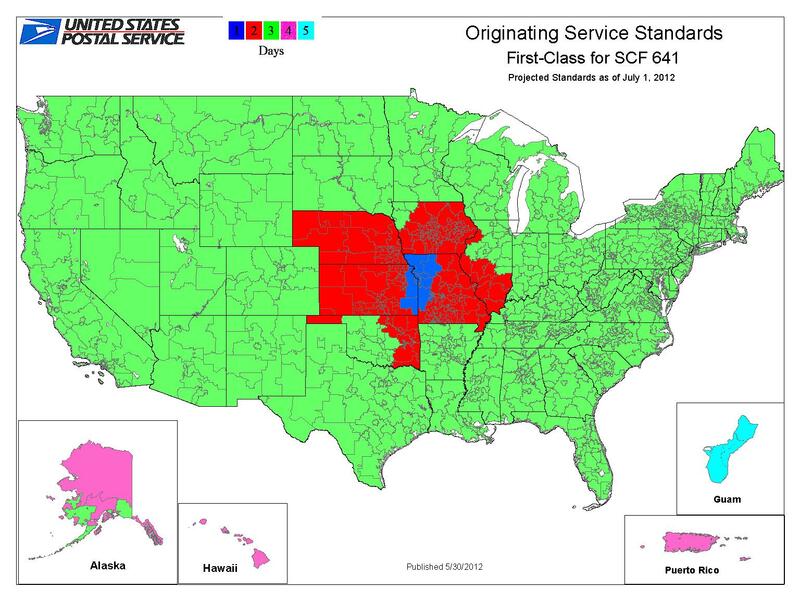 just published Service Standards Maps for all classes of mail at all points of entry. 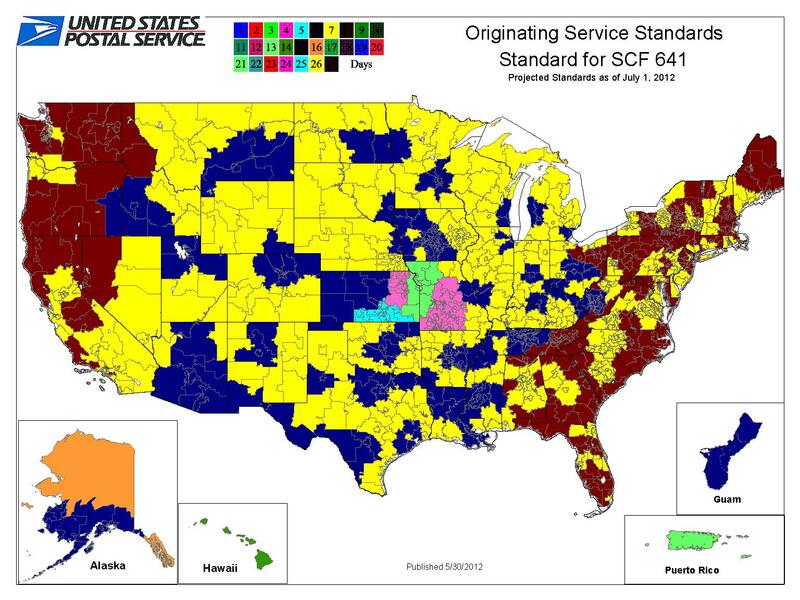 These are the new Service Standards effective July 1, 2012 (the beginning of Phase 1 of the USPS network rationalization). It’s easy to use – simply choose your class of mail and your SCF area (first three digits of your ZIP code) and away you go. Plan ahead, review your Service Standards and save a few dollars of your marketing budget! Is Bulk Mail Right For You? Have you considered Bulk Mail? “Bulk mail” is considered large quantities of mail that qualify for reduced postage rates. Oftentimes, “bulk mail” is referred to as “presorted mail”. Bulk mail can be used for First Class Mail, Standard Mail and other classes of mail as well. When you put a stamp on a piece of mail and drop it into your local mailbox, that is “single piece” mail and you are paying full price postage. If you meet minimum qualifications (or choose to utilize a presort mail vendor), you can take advantage of bulk mail rates and save money. The deciding factor for choosing bulk mail is postage savings. The USPS offers discounted postage rates for presorting the mail before it comes to them. You are doing a portion of the work for them (such as sorting by ZIP Code), so savings from the Postal Service are passed along to you, the mailer. Bulk mail may not be the best choice for every mailer. Presort vendors are in the business of preparing mail according to USPS rules and regulations. Some vendors will take your mailing from start to finish – design, printing, presorting and USPS presentation. Should you choose to prepare your own bulk mailing, here are the minimum number of mail pieces that must be met to qualify.